"We fought to keep our beautiful creation safe. And now this beast has come, claiming to be King. Mara Sov bows to no one." The Battle of Saturn was the first conflict of the Taken War, the invasion of the Solar System by Oryx, the Taken King. Prior to the battle, Eris Morn warned The Queen of Oryx's impending threat, prompting the Queen and her forces to set a course for Saturn in an attempt to challenge Oryx's armada. "You and I know how this ends. We've known since you've escaped from that...pit. The Awoken have played their part. This... was all part of the plan. Guide them, my Hidden friend. It is all up to you now." Leading a massive fleet of Hive warships and Tombships with his Dreadnaught, Oryx had come to destroy humanity in retribution for the death of his son, Crota. Oryx halted his fleet over Saturn, and it was here that the Awoken, led by their Queen Mara Sov and her brother Uldren, attacked. The Awoken Fleet, consisting of multiple captured Fallen Ketches and Awoken fighters, attacked Oryx's fleet by flying through Saturn's rings to take them by surprise. 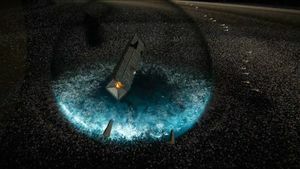 The space around the Hive armada quickly became filled with weapon discharges and explosions as furious combat erupted. The battle seemed relatively even, with the Hive suffering heavy losses among their warships and Tombships despite the destruction of many Awoken fighters. From her flagship on one of the Ketches, Mara Sov stood with her Techeuns, working with them in order to conjure Harbingers, massive homing energy projectiles that were then fired at the Hive fleet. The projectiles proved to be quite powerful, smashing through multiple Hive cruisers without slowing down, but when they impacted upon the hull of Oryx's Dreadnaught they simply faded away, leaving it undamaged. With the Queen's power useless, Oryx (who had been watching the battle from a room on his Dreadnaught) countered with a display of his own might. Using the Dreadnaught's primary weapon, Oryx sent out a massive shockwave that not only destroyed the entire Awoken fleet along with much of his own support vessels, but also created a massive hole in Saturn's rings. As the weapon fired, many Awoken ships attempted to escape the blast, but were unsuccessful. Though the battle ended in a devastating defeat for the Awoken, their attack had succeeded in damaging the Hive fleet to such an extent that Oryx was forced to keep his Dreadnaught in orbit over Saturn and send the Taken ahead to lay the groundwork for the invasion, rather than immediately advance on the inner worlds. "My contacts near Saturn say the weapon fired only once." "It's not like the Queen to attack a superior force..."
"How could she have known? ...How can anyone?" With the Awoken dealt with, Oryx turned his attention to the inner system, sending his Taken army to assault Cabal positions and facilities across Mars, which dealt massive casualties to the Dust Giants, Blind Legion, and Sand Eaters legions on the planet. During one of these attacks on a base on Phobos, the Cabal were able to send a distress signal. Commander Zavala sent a Guardian in response, and the Last City learned of the threat of Oryx. Meanwhile, the Awoken took stock of their losses. Paladin Kamala Rior, one of only three surviving Paladins, conducted a search-and-rescue survey around Saturn and its moons, but failed to find any other survivors. The Reef leaders who had participated in the battle, including Paladin Yasmin Eld, Paladin Leona Bryl, Paladin Abra Zire, Paladin Pavel Nolg, Techeun Shuro Chi, Techeun Sedia, Techeun Kalli, and Queen Mara Sov, were officially declared deceased. With the Queen gone, Petra Venj was appointed acting regent-commander of the Reef. Uldren Sov, whose ship was specially shielded, survived the blast; his ship later crash-landed on Mars. As his Crows repaired his ship, Uldren resolved to begin a search for his sister, sensing that she may still be alive.